"May Day in Los Angeles, 1980" - Mark Vallen. 1980 ©. Print from 35mm Diapositive. 6.5 x 9.75 inches. This photograph was taken in L.A.'s MacArthur Park just moments before the Los Angeles Police Department attacked a large crowd celebrating International Workers Day. The rally had been the first significant May Day demonstration to take place in L.A. since the 1960s. On view at the Morono Kiang Gallery's "Faraway, So Close" exhibit. I will be exhibiting six never before shown photos at Faraway, So Close, a group exhibition of photographs on the theme of Los Angeles as it existed between the years 1980 and 1989. Running from February 4, 2012, to March 31, 2012 at the Morono Kiang Gallery in downtown Los Angeles, the exhibit also features works by Sara Jane Boyers, Edward Colver, Willie Middlebrook, Ann Summa, May Sun, and Richard Wyatt. Some participants in the exhibit are celebrated photographers known for capturing the visage of L.A. with their gifted camerawork. Others - this would include me - are more interested in painting the city’s diversity on canvas, using photography only as an optional extra tool in the artistic process. What unifies these two schools in Faraway, So Close, is an intention to catch something of the truth about life in Los Angeles. I have always been interested in the connection that exists between drawing, painting, and photography, ever since I discovered as a pre-teen that the 17th century Dutch painter Johannes Vermeer quite possibly used a camera obscura as a tool in creating his fabulous oil paintings. Just as Shahn and Siqueiros used their snapshots as starting points for more complex works, I too have used my photos as source material for drawings and paintings. While I have never regarded myself as a photographer, there is a correlation between my art and the photo. As a figurative realist artist the camera has always provided me with the ability to capture fleeting realities to be studied, interpreted, and built upon in the studio. For me the camera serves as a sketchbook of sorts, it is the means to an end, i.e., extrapolating on the information it gathers in order to create drawings, paintings, and prints that comment on the human condition. "Bandera Roja/Red Banner" - Mark Vallen. 1985 ©. Print from 35mm Diapositive. 6.5 x 9.75 inches. 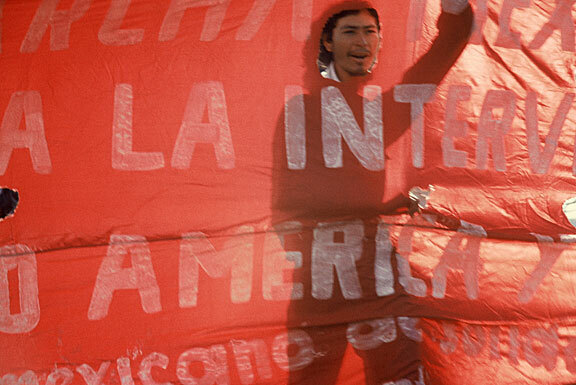 An activist helps carry a banner emblazoned with slogans during a downtown L.A. march that took place on April 20, 1985 - a national day of protest against the policies of the Reagan administration. On view at the Morono Kiang Gallery's "Faraway, So Close" exhibit. Throughout the late 1970s and 1980s I carried a 35mm camera, using it as a “sketchpad” to keep a record of the ever changing social landscape that is Los Angeles. During that period I took informal photos of everything from L.A.’s explosive punk rock scene (which I was actively engaged in), to the mass protests organized by the peace and anti-Apartheid movements (where I was also involved as an activist). 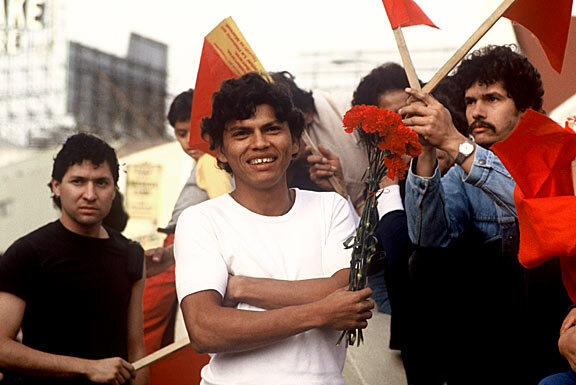 My selected photographs in Faraway, So Close show my participation in, and documentation of, the Central American solidarity network that was such a large part of L.A.’s political landscape in the 1980s. The Opening Reception for Faraway, So Close takes place on Saturday, February 4, 2012, from 6 to 9 p.m. The Morono Kiang Gallery is located in downtown Los Angeles on the ground floor of the historic Bradbury Building; 218 West 3rd Street, Bradbury Building. Los Angeles, CA 90013 (directions and map). Regular gallery hours are 12 to 6 p.m., Tuesday through Saturday. 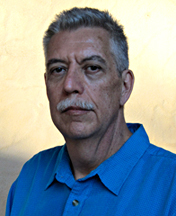 The exhibit runs until March 31, 2012. UPDATE/Read the Los Angeles Times review of the Morono Kiang exhibit, Photo File: ‘Faraway So Close’ documents turbulent ’80s in L.A. 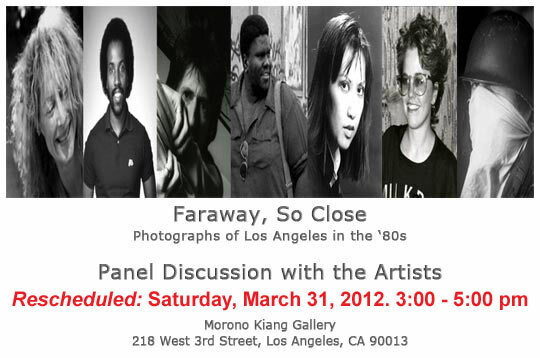 The Morono Kiang Gallery will host a panel discussion with the artists of Faraway, So Close on Saturday March 31, 2012 from 3:00-5:00 pm. Please join us as artists (shown above) Sara Jane Boyers, Richard Wyatt, Edward Colver, Willie Middlebrook, May Sun, Ann Summa, Mark Vallen, and Shervin Shahbazi (not pictured), recount life in 1980s Los Angeles, talk about their experiences in a changing cultural landscape, and answer questions about their work.